Have you pledged to go green this year? Are you looking to reduce your waste and plastic usage? We are living in a disposable, single-use world and things are starting to change. When people consider having laser hair removal the environment isn’t usually a huge factor in their decision making but, it should be. Disposable razors are a modern convenience that the nation has grown to love and are buying more and more of. Is shaving your legs every few days really that convenient? Do you ever get that sinking feeling on your way to yoga that you haven’t shaved your armpits? We believe that disposable razors are unnecessary and their usage should be reduced. Millions of disposable razors in the UK are filling landfills each year and they are not recyclable. In addition to the razor itself, you also have the added waste of foams, gels and creams. Also not shaving every shower would shorten your shower time reducing your water usage. Even the actual process of manufacturing and shipping razors is harmful to the environment and can be avoided if people move away from them. 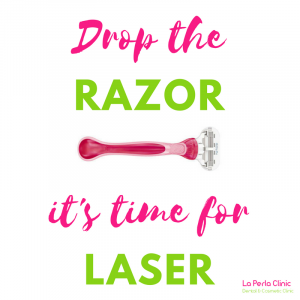 If you are trying to rid yourself of plastic and causing unnecessary waste then laser hair removal should be your treatment of choice! And we haven’t even mentioned all the money it would save you too!